This unit was selected because of the black cones rather than silver. The sound is awesome and everything works fine except now there is what sounds like someone turning on a microphone like a popping sound as if the mike is on and it interrups the listening of FM and CD. I am wondering if it is worth fixing? I must take it to a shop and see what in the world this noise is. 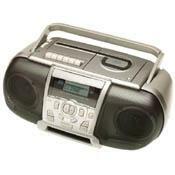 The handle is great and antanae and cassette features and memory.